Manteca's Jacob Gomes, 18, spends time at Stockton 99 Speedway on Friday in preparation for tonight's Supermodified Racing League's Southwest Tour race. Gomes currently holds a slim points lead over veteran M.K. Kanke of Frazier Park. STOCKTON - Jacob Gomes has been going to Stockton 99 Speedway since he was a young child and knows the track well. But the best part about what he called a "home race" will be sleeping in his own bed. The 18-year-old Manteca driver returns to San Joaquin County as the Supermodified Racing League's Southwest Tour points leader, and he'll try to expand his lead in today's Jackson Rancheria 135 at Stockton 99 Speedway. The program begins at 6 p.m. and includes the Legends, Pro-4 Modifieds, and NCMA Sprint Cars divisions. Gomes, who graduated from East Union High this year, won the Southwest Tour event at Stockton on June 18 and comes into this race with a slim 1,011-1,005 points lead over veteran M.K. Kanke of Frazier Park. Gomes said he's glad the series has returned to his home track after road trips to tracks in places such as Las Vegas and Salt Lake City. "I'm very comfortable there. I've been going to that track since I can remember, and you know how that track will react in race conditions," Gomes said. "Plus, you get to sleep in your own bed and make a quick trip to the track. You are less likely to overthink things. At a travel race, you have a lot of time to think." Winning a major regional series would be yet another shining accomplishment in his young career. 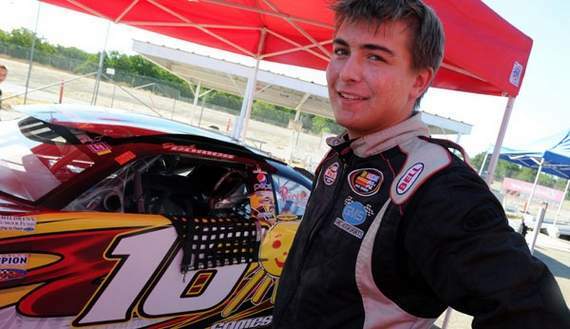 He had not raced a car bigger than a Mini Cup until he moved into stock cars in 2009, and he won the NASCAR Whelen All-American Series Rookie of the Year at age 16 in 2009. He won the Tri-Holiday series at Stockton 99, but the 10-race Southwest Tour is loaded with some of the top racers in the region. "I think he has progressed very well," Kanke said. "This division is very tough. To run up front like he has is a very good statement by him. He'll be tough." Kanke, 49, won't be easy to deal with, either. He won the Southwest Tour title in 2009 and has more than 25 years of racing experience. "He's been around longer than I've been alive, and it's an honor to race with him," Gomes said. "Hopefully I can beat him and the rest of the field." Gomes is not the only local competitor hoping for good luck this weekend at Stockton 99. Ross Strmiska of Manteca, whose family has raced at Stockton since 1969, is fifth in the points standings (904) and looking for his first win of the season. He finished fourth in Stockton in June after going to the back of the field and working his way through it. "We're still running pretty good. We should be closer to the points lead but we had some bad luck," said Strmiska, 25. "We've been really fast at Stockton, and it would be nice to break through and win." Eric Holmes of Escalon, a two-time NASCAR Grand National champion, is scheduled to be in the field, as is Colby Potts of Stockton, Stockton 99 regular Dave Byrd of Seaside and Michael Sandoval of Ripon, who is the leader in the Southwest Tour's rookie of the year competition.